The surface of an acrylic tub is very easy to keep clean; there are no pores for dirt to penetrate, so dirt will just rinse off. For sanitary purposes, you should clean your bathtub with non-abrasive soap. 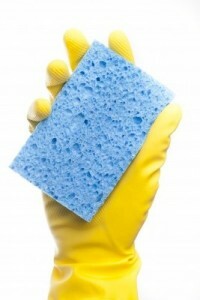 Dishwashing detergent such as Joy, Palmolive, Ivory, etc and a soft sponge or cloth is all that you need. If you spill something on the bathtub and need something stronger, the following are SAFE to use: Fantastic, Tackle, Top Jop, Formula 409, ScrubFree, Calgon Bath, Windex. Do Not Clean Your Acrylic Bathtub with Paint Thinner, Goof OFF, Scrubbing Bubbles, Acetone, Lacquer Thinner, M.E.K. or other chemicals that attack the structural integrity of plastics including, but not limited to, acetones). Use of these chemicals will destroy the acrylic surface of your bathtub and there is no way to reverse the damage caused by this type of chemical reaction. Use of these chemicals will void your warranty. If you should happen to dull, scratch or chip your bathtub, the appearance can be restored back to its new look. Scratches and dulling can be removed with a liquid polisher such as Gel-Gloss. Deep scratches or burns can be removed with very fine sandpaper (600 grit or higher) and then finished with a liquid polish. A jetted bath is different from a spa or hot tub. A hot tub or spa is typically installed outside. It is filled once and kept hot. The water in a hot tub has to be treated with chemicals to keep it clean, where as a bath is filled then emptied each time it is used. Because jetted bathtubs do not have chemicals to kill bacteria, they have to be cleaned. It’s important to clean the jets regularly to keep your tub enjoyable. Just like your dishwasher cleans itself, here’s an easy, inexpensive way for your jetted tub to clean itself. 1) Fill the tub above the highest jets with warm water. 2) Add 1/4 cup of liquid dishwasher detergent to the water. 3) Add 1/2 cup of household bleach to the water. 4) Run the jets for 10-15 minutes. Set the jets to the highest pressure. 5) Drain the tub and refill it with cold water. 6) Run the jets for another 10 minutes as a rinse. 8) Wipe the tub clean with a soft cloth. Repeat the process once a month or more often if necessary. There are specialty whirlpool jet cleaners available but they are more expensive.